[SatNews] Star Navigation Systems Group Ltd. has introduced the new and improved STAR-ISMS(tm) In Flight Safety Monitoring System, the ideal counterpart to the "black box" and a quantum leap in aerospace safety technology. Most people are familiar with the "black box", the near indestructible sealed recording device that assists investigators in determining the cause(s) of an aircraft accident. What isn't as well known is that black boxes are not the complete solution, because by their very nature they are designed to indicate problems after such has already occurred. Star Navigation's In Flight Monitoring Service, first introduced in 2005, performed all the functions of black boxes while providing current information to pilots and ground controllers, giving the ability to note any anomalies and to nip problems in the bud. 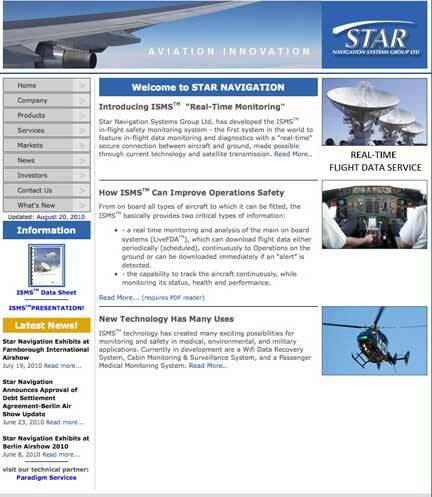 The improved STAR-ISMS™ In Flight Safety Monitoring System provides real-time and after-landing reports, intelligent flight data transmission, plus more detailed live flight data alerts through the efficient use of leading edge satellite-based technology. One of the main features of the new STAR-ISMS™ is its built in GPS tracking software that enables more accurate tracking of an equipped airplane to the last known latitude, and longitude. It also boasts improved accuracy and the ability to instantly provide an aircraft's exact altitude, heading and airspeed. The essential avionics and diagnostic information collected by the STAR-ISMS™ is transmitted at operator defined intervals or triggered events, via satellite, to ground-based installations in real time regardless of weather conditions. Additionally, Star's on-board hardware and software will independently analyze all selected incoming sensor and systems data and compare it with normal parameters — any deviation is noted and an alert is sent out if necessary. In the event of multiple failures, the automated "Mayday" feature commences an immediate “data dump”, sending as much information as bandwidth will allow. It can be said that STAR-ISMS™ opens a "virtual window" into the in-flight operation of a commercial aircraft. While the next-generation safety and monitoring technology featured in the STAR-ISMS™ In Flight Safety Monitoring System is not meant to replace airline black boxes, its use alongside them adds an extra level of safety that can be counted on to save time, money, and most importantly lives. The STAR-ISMS™ In Flight Safety Monitoring System uses proprietary, patented Canadian technology and Star owns the exclusive world-wide license to this technology. Certified by Transport Canada and the Federal Aviation Administration, STAR-ISMS™ has been extensively tested and fully developed during normal commercial aviation settings and is now ready for deployment on the world's aviation fleets.